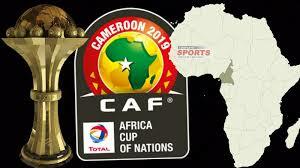 Nigeria’s Super Eagles were among seven teams to book berths in next summer’s Africa Cup of Nations in Cameroon. Gernot Rohr’s three time champions held 1996 winners South Africa 1-1 to clinch one of the two slots available from Group E. The Bafana Bafana need a draw in their final qualifier away to Libya to avoid missing out on the biannual continental showpiece. Uganda, Morocco, Mauritania, Algeria, Guinea and Ivory Coast also clinched places in Cameroon 2019 with a game to spare. Sebastian Desabre’s Uganda Cranes kept their fifth clean sheet in as many games to edge Cape Verde 1-0 in Kampala. Victory lifted the 1978 losing finalists to an unassailable 13 points and a ticket into their second consecutive finals. The East Africans were joined by four West African sides on Sunday. Former African Footballer OfThe Year Riyad Mahrez netted twice in Lome to guide 1990 champions Algeria to a 4-1 triumph over bewildered hosts Togo. The whitewash propelled the Desert Fenecs to the summit of Group D with. Second placed Benin missed out on qualifying when they fell 1-3 to Gambia in Banjul. In Conakry, a one-all draw between Guinea and Ivory Coast saw both teams emerge from Group H. Guinea’s Sylla possess the group’s bragging rights as their eleven points cannot be surpassed by the Ivorian Elephants. In Libreville, Moussa Doumbia’s solitary goal was enough to power Mali past Gabon and a place in Cameroon. Herve Renard’s Atlas Lions had on Friday made mashed potatoes of Clarence Seedorf’s five time champions Cameroon 2-0 to open up a two point lead atop Group B ahead of next March’s trip to tailenders Malawi. 1976 champions Morocco cannot be caught as the second placed Indomitable Lions will cancel each other out with third placed Comoros on the final day. In Juba, Abdul Razak Fiston grabbed a rapid fire hat-trick as Group C’s surprise package Burundi fought back to defeat South Sudan 5-2. The Swallows must however avoid defeat in the ultimate qualifier against Gabon next March to clinch a maiden AFCON finals place. 2012 winners Zambia were the biggest casualties of the weekend qualifiers as a 63rd minute goal from Reginaldo Faife condemned the Copper Bullets to a 1-0 setback against Mozambique in Maputo. The hosts remain in Group K contention along with Namibia and Guinea Bissau who played out a goalless stalemate in Windhoek. Tunisia’s Carthage Eagles, Egypt’s record winning Pharaohs, Senegal’s Indomitable Lions and upstarts Madagascar had already booked their places ahead of the weekend matches. The 2019 edition of the African Nations Cup has been expanded from 16 to 24 teams. Next year’s tournament is to be played during the Northern Hemisphere summer for the first time ever.